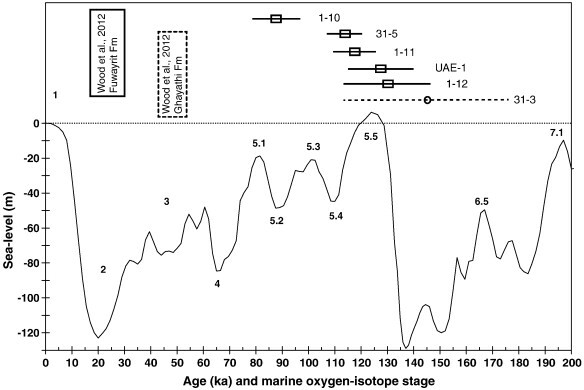 A paper published today in Quaternary Research reconstructs sea levels in the Arabian/Persian Gulf over the past 200,000 years and finds that during the last interglacial [Eemian, MIS 5.1-5.5 below] around 120,000 years ago, sea levels were as much as 5 meters [16 feet] higher than the present for around 10,000 years. The authors find this sea level rise was almost entirely eustatic [from the melting of glaciers] rather than tectonic movements, which were found to be "negligible." Other papers have found sea levels during the last interglacial were up to 31 feet higher than the present in other locations. Ice core analysis also shows Greenland was 8C warmer than the present during the last interglacial. These changes obviously occurred naturally and there is no evidence that the current interglacial is any different. Present day sea level is indicated by the dotted horizontal line at zero meters, shown in upper left. Horizontal axis is thousands of years before the present. During the last interglacial [MIS 5.5 shown above] around 120,000 years ago, sea levels were as much as 5 meters higher than the present for ~10,000 years. Accurate sea-level reconstruction is critical in understanding the drivers of coastal evolution. Inliers of shallow marine limestone and aeolianite are exposed as zeugen (carbonate-capped erosional remnants) on the southern coast of the Arabian/Persian Gulf. These have generally been accepted as evidence of a eustatically driven, last-interglacial relative sea-level highstand preceded by a penultimate glacial-age lowstand. Instead, recent optically stimulated luminescence (OSL) dating suggests a last glacial age for these deposits, requiring > 100 m of uplift since the last glacial maximum in order to keep pace with eustatic sea-level rise and implying the need for a wholesale revision of tectonic, stratigraphic and sea-level histories of the Gulf. These two hypotheses have radically different implications for regional neotectonics and land–sea distribution histories. Here we test these hypotheses using OSL dating of the zeugen formations. These new ages are remarkably consistent with earlier interpretations of the formations being last interglacial or older in age, showing that tectonic movements are negligible and eustatic sea-level variations are responsible for local sea-level changes in the Gulf. The cause of the large age differences between recent studies is unclear, although it appears related to large differences in the measured accumulated dose in different OSL samples.